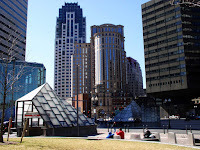 Geometric shaped buildings in Dewey Sq., viewed from the plaza in front of the Federal Reserve Building. The entrance to the T in the lower left is interesting and reminds me a little bit of the I.M. Pei designed Louvre Pyramid.